Part of #44109. See Zulip topic for previous discussion. I anticipate a lot of review comments so I'd appreciate any feedback and I'm happy to make any requested changes. I tried to split some of the later commits up to make it easier to review but unfortunately wasn't able to with the earlier commits that did the bulk of the refactoring. Looks like something went wrong during rebase because ppaux.rs and item_path.rs no longer exist on master. This work would benefit from splitting into two PRs - one for the DefId separation refactoring and no functional changes, and another for the non_exhaustive part. I may be mistaken, but isn’t this due to #58140 landing? I’ll split this into two PRs. I wanted to make the RFC 2008 changes on top so that I could confirm that the refactoring did work as expected. Oh, I see. I didn’t realise this PR still had those files, will fix that too. Fixed this in force push below. Filed #59382 with the refactoring, marking this as S-blocked and will rebase atop master when/if #59382 lands. ☔️ The latest upstream changes (presumably #59096) made this pull request unmergeable. Please resolve the merge conflicts. Part of #44109. Split off from #59376. See [Zulip topic](https://rust-lang.zulipchat.com/#narrow/stream/131828-t-compiler/topic/rfc-2008/near/132663140) for previous discussion. Rebased atop master now #59382 has landed, unblocked. Add comments for new `AdtDef` functions. cc @rust-lang/rustdoc for the final commit which modifies rustdoc to extend existing non-exhaustive support to enum variants. when the variant is marked as non-exhaustive. Does it generate a whole page for enum variants now? the `#[non_exhaustive]` attribute is now available for enum variants. Support non-exhaustive enum variants in rustdoc. 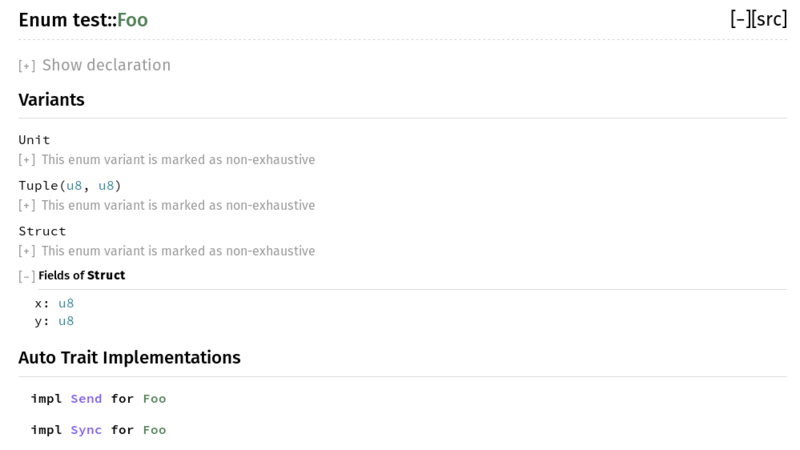 extending the existing support for non-exhaustive enums and structs. For reference, here are the equivalent messages for structs (expanded) and enums (expanded). All that the final commit of this PR does is add support for these messages and make it so that the non-exhaustive sections always start collapsed (since they're a lot of repetitive text otherwise). Ah I see! Looks good to me then. Rustdoc code looks good. Thanks for the screenshots! Part of rust-lang#44109. See [Zulip topic](https://rust-lang.zulipchat.com/#narrow/stream/131828-t-compiler/topic/rfc-2008/near/132663140) for previous discussion. After merging rust-lang#59376 I realized that the code in the decoder wasn't entirely correct - we "decoded" fictive variant constructors with their variant's visibility, which could be public, rather than demoted to `pub(crate)`. Fictive constructors are not directly usable in expression/patterns, but the effect still can be observed with imports.